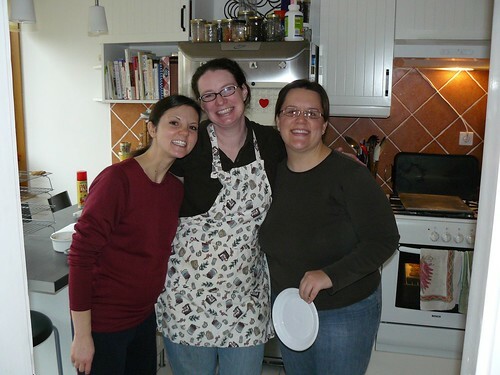 Above: Teammates Heidi and Brenda with Sharon creating a one day cookie factory in our kitchen. 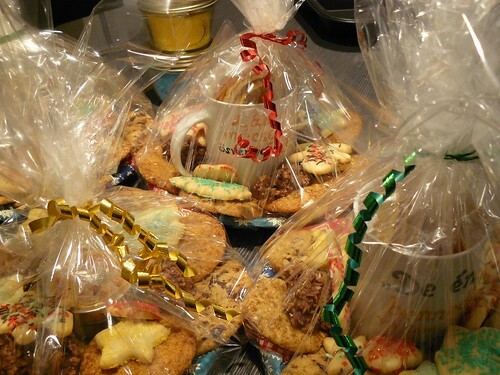 With their combined creativity they made special cookie plates for various friends and neighbors. 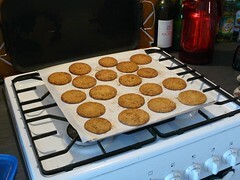 Above: The final product. 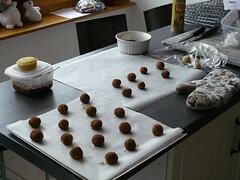 Thankfully, Ben, Ellie, Kira and I were the taste testers throughout the day. 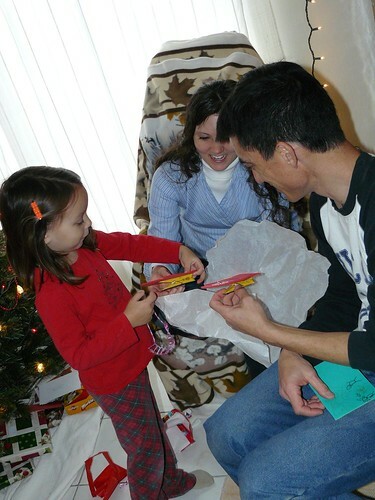 Above: Elianna explaining how her magnet mittens gifts for Roger and Heidi stick to the refrigerator. 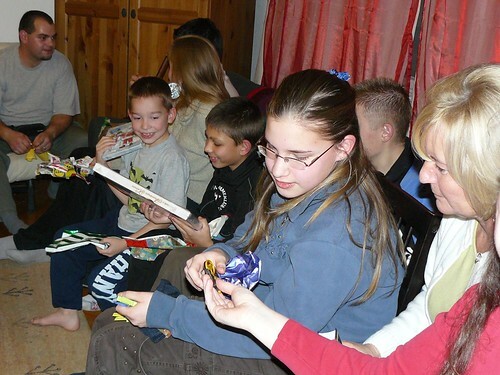 Heidi and Roger who have recently moved to PetÅ‘fibánya to join our team invited us for a fun Christmas Eve together. 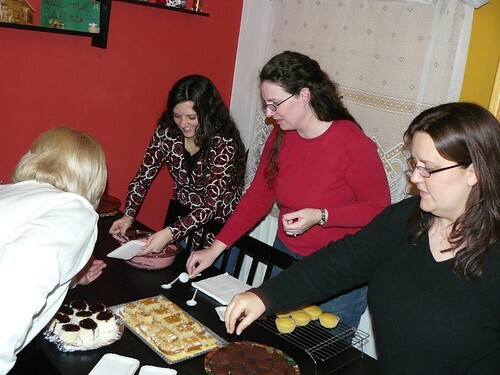 Above: They were kind enough to prep the materials for our kids (or us) to build a gingerbread house. Above: O.K., nobody move or the walls will collapse! 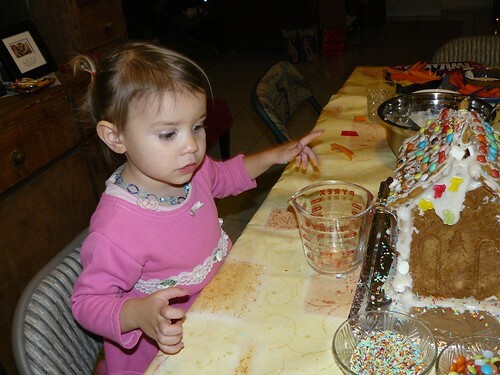 Above: It was cute to watch Kira put more candy in her mouth than on the house. Above: An almost white Christmas. Above: The kids doing a compilation of the verses they learned over the past few weeks with mom. Above: Catching the “Awesome” from Ellie and the “YESSSS” from Ben. Ben had a bought with croup cough a few nights ago, but after much prayer support and practical measures, God was gracious to bring healing. Above: Kira enjoying her Play-dough ice cream cone maker. Above: The gifts just keep coming! The kids are blessed to have so many loving friends. 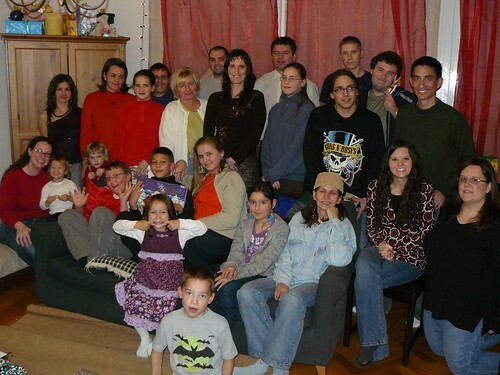 We spent our Saturday visiting our friends the Mitchells in Budapest. Above: After some coercing, Elianna was willing to stand for a split second for a picture before running away giggling. Above: The had a great evening and ended the night with some crazy dancing. 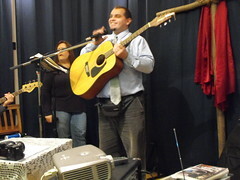 Above L: Miki leading worship. Above R: Happy Hugi giving testimony of God’s provision in her life and the blessing of having a local church. 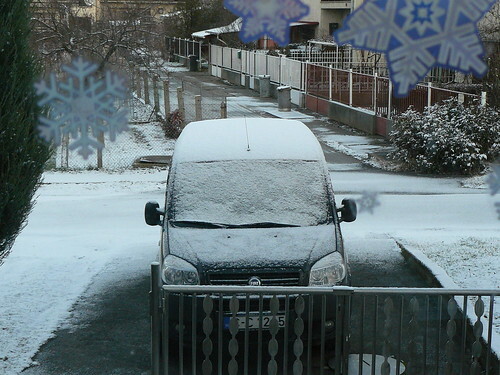 Apparently, just before Christmas someone robbed Hugi and Gábor’s garage. 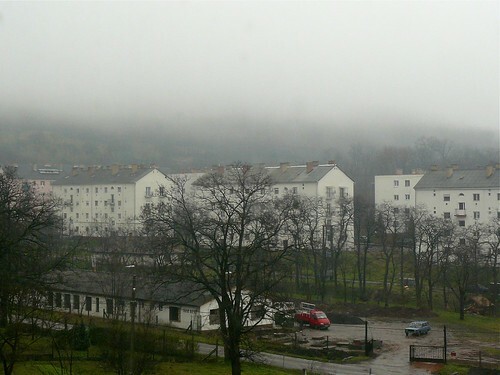 Later Gábor found out who the perpetrator was, and they lived in the same apartment complex. 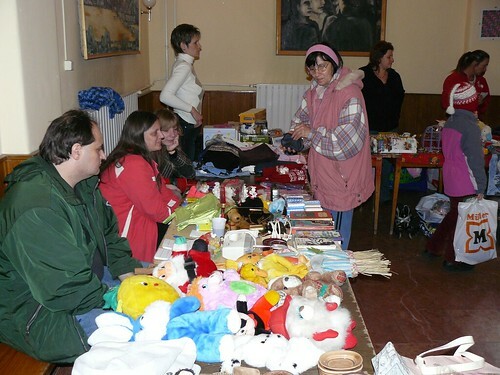 On Sunday before Christmas, our church received donations of gifts for members to distribute to those in need. Gábor came to Miki and requested a gift. It turns out he wanted to give the gift to the family that stole from him. 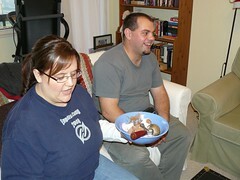 Hugi and Gábor bought fresh fruit, and with the gift delivered the package. 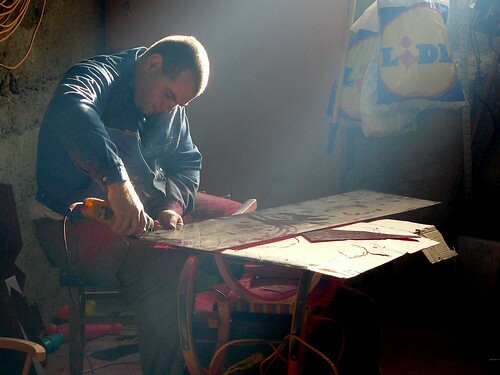 Gábor said that the family didn’t know what to do with such kindness. It was simply unbelievable and completely unexpected. Praise God for members applying His teaching and blessing others through their obedience to Jesus. 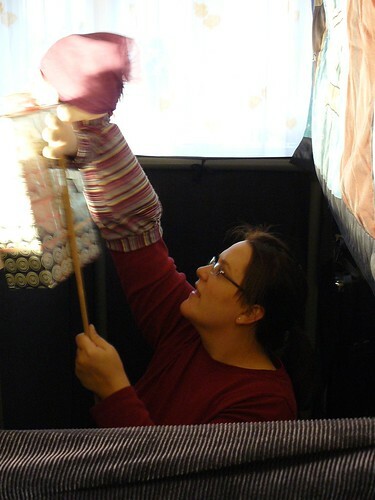 Above: Heidi greeting those entering our Christmas Rummage Sale. We gave each person a gift packet including a church invite, an evangelistic book and for those who were willing a questionnaire. 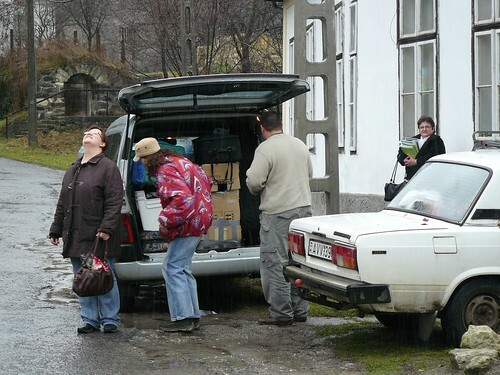 Above: Church members Hugi and Gábor. Gábor took the responsibility of going over the questionnaire with people. 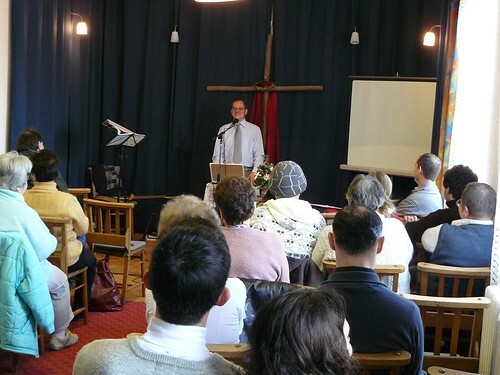 Out of thirteen people that Gábor spoke with, there were only three that expressed no interest in knowing more about a personal relationship with God. The others gave either an email address or a phone number. Please pray for us to be wise with follow up. It was amazing how many old acquaintances we ran into at the rummage sale. Our old neighbor who’s daughter attended our English Camp stopped by. 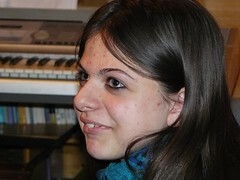 She was one of the ten who expressed interest in knowing more about a personal relationship with God. The retired couple that we bought our house from also came to sell some goods. Their daughter ended up sitting right next to us and to our amazement was fluent in English. We had a great conversation about family and community. Above: Teammate Brenda was sure to put fun Christmas bows in Elianna and Kira’s hair when they arrived at today. 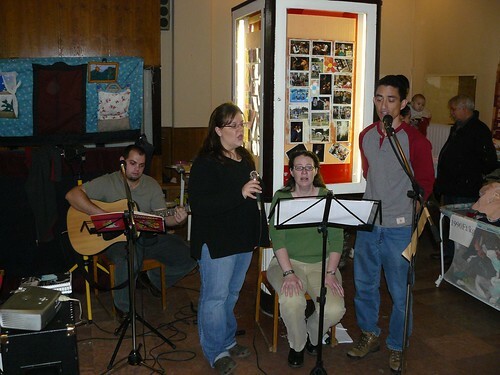 Above: Miki, Brenda, Sharona and Roger singing Christmas songs in the background as people wandered from table to table. Above: Church member Andi helping Roger prepare invites and a handmade card with a Bible verse for guests. 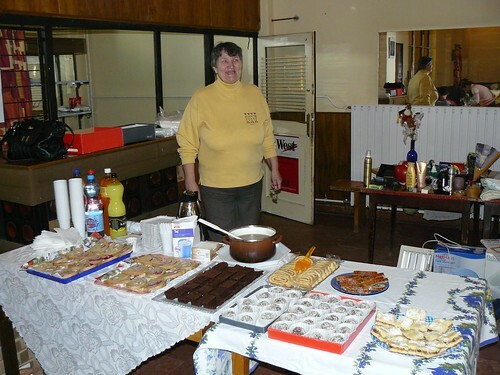 Érzsi served by offering refreshements throughout the day. As our long term goal is to move on to plant another church, it is important that we first equip the members of this church plant to serve according to the giftings God has given them. We have been meeting weekly for a discipleship class learning about basics of our faith and just recently how to share the Gospel. 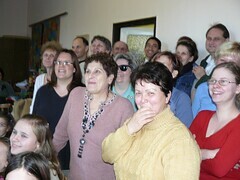 We were encouraged to see the entire church serve together to organize and carry out this event. In 2009 we hope to see members taking more and more responsibilities and serving in such a way that will free us up to begin planting in another town. There is still much work to be done in mentoring and we will continue to seek the Lord’s timing every step of the way. 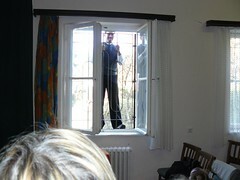 Above: Children and parents coming to see our afternoon puppet and drama show. Some of these kids already saw our show earlier in the week but enjoyed it so much that they wanted to see it again! 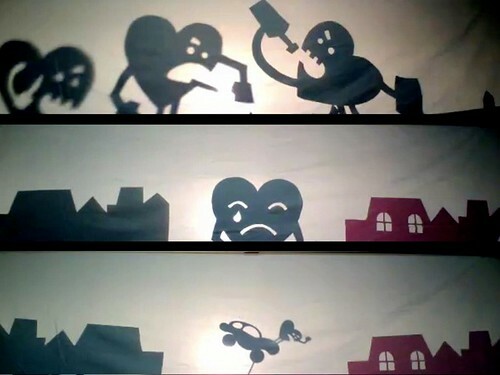 Above: Behind the scenes in our shadow puppet show where we illustrate the coming of sin and death through the disobedience of Adam and Eve. 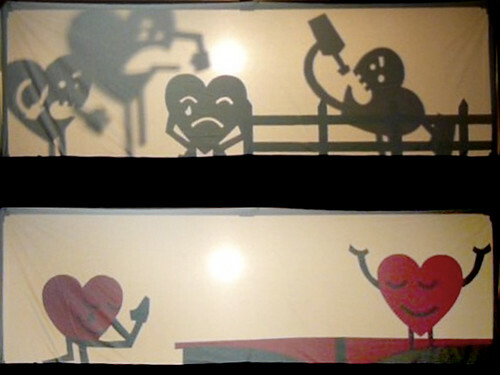 Above: Our shadow puppet show is a mix of real people and heart characters telling the story of the Gospel. This is the first time we endeavored to produce a project like this and we are thankful that God helped us to pull it off. The kids in every place we have showed this performance seem to be captivated by the story and the visuals. 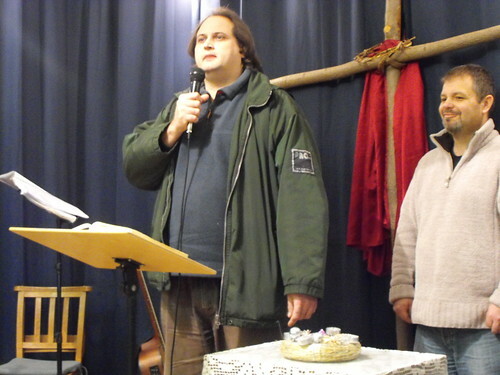 Above: DezsÅ‘ preached today about the greatest gift of eternal life through Christ in our Christmas worship service. Later in the service, his wife Marcsi gave testimony to a recent doctor’s visit that revealed she had been completely healed of cervical cancer that she battled through the years. DezsÅ‘ also gave testimony about some family members who’s recently born child was admitted to the hospital for a life threatening problem. DezsÅ‘ and others in the church prayed for the child and he was later released. 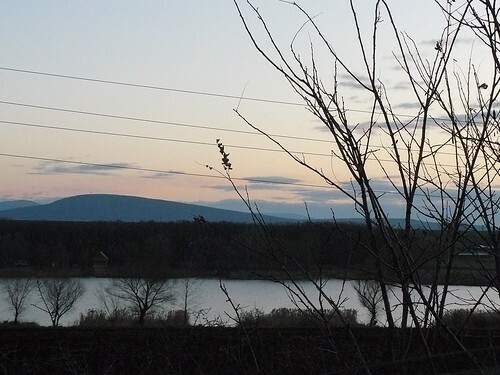 The parents of the child who have for years been resistant and cold when it comes to talking about faith in God expressed warm gratitude to DezsÅ‘ for praying. 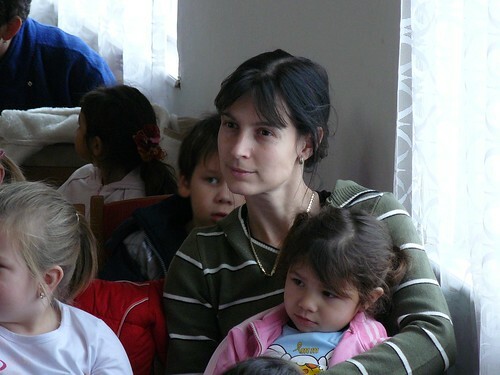 Above: Church member Marika gave testimony to God opening up an opportunity to share the Gospel (what she has just been learning about in discipleship class) in the midst of shopping in the neighboring town of Zagyvaszántó. Above: After setting up the church for a group shot, I discovered I couldn’t frame everyone in the amount of space I had with my camera. I had to run out side, scale a small wall and take the shot from the window. Well, it’s one way to get everyone looking and smiling at the camera. 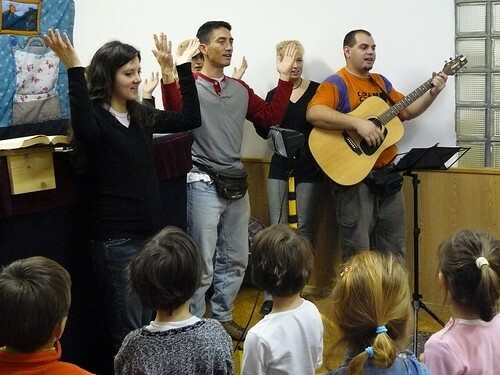 Above: We praise God for building His Church in PetÅ‘fibánya. We have seen various members come to a deeper faith in Jesus and had great joy in seeing them begin to serve in their giftings in the church. Thank all of you for the various ways you support us! Unfortunately our first planned destination of Zagyvaszántó informed us upon arrival that we did not make a necessary follow up call to confirm our coming. Therefore we returned home a bit saddened, but optimistic that God would give us another opportunity to go to Zagyvaszántó at Easter. Above: As older students set up chairs for the younger kids, they immediately recognized us. 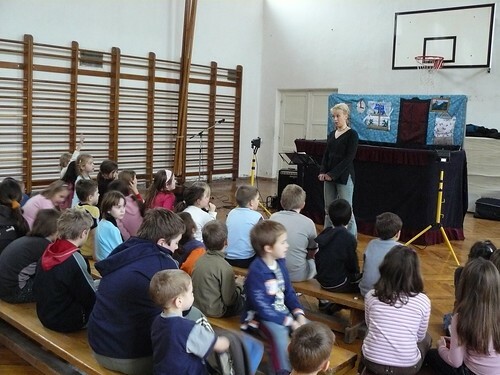 A couple of them commented that they remembered us from a visit to their previous school located in Szirák. Apparently, schools have been shutting down and districts have been restructuring causing many students to now attend different schools. We are thankful that even with the shifting of locations for students, they still run into us every year as we present the Gospel. After today’s show in Héhalom (hey - hall - ome), the teachers invited us for coffee and conversation in the teacher’s lounge. One of the teachers said that her granddaughter was in the audience today and she thoroughly enjoyed the show. She also said that she has the CD from last year and listens to it so mucht that she knows the songs and stories on it by heart. This is so encouraging to hear as we don’t have ability to follow up in everyplace we go. 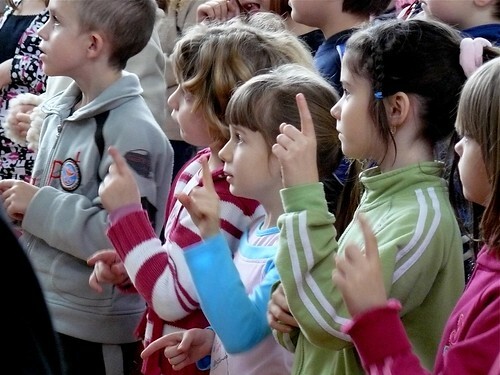 These materials help the children to continue to hear God’s truth throughout the year. Above: This was our first time in the village of Bér (Bear). 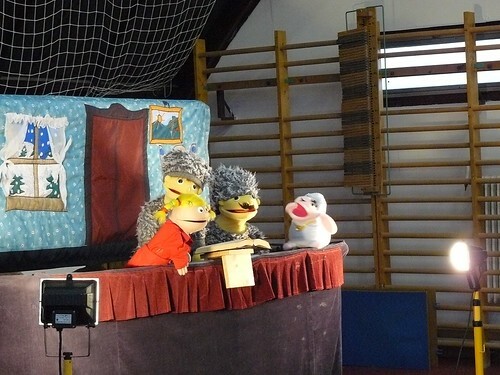 Through various connections they heard that we had a puppet team and invited us to perform in their preschool. 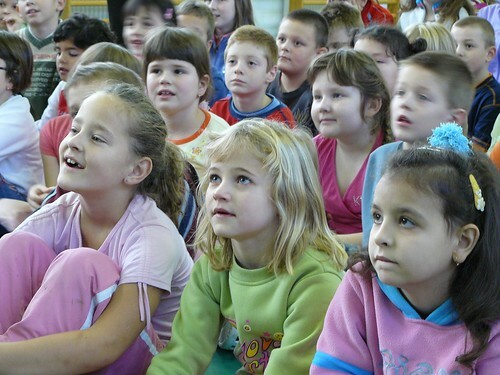 I noticed that some of the kids in the audience had above average spiritual knowledge. 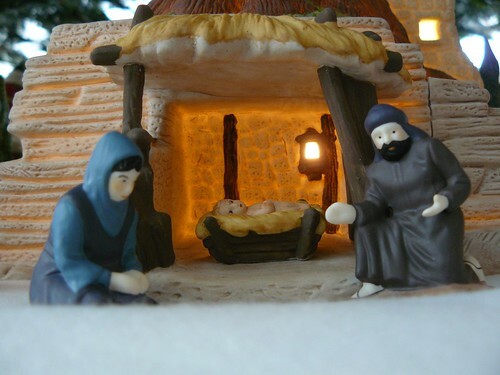 When Miki asked, “What is the most important gift at Christmas.” A child said literally, “God’s one and only Son, Jesus Christ.” One child began speaking out John 3:16 before Miki could even get through the verse. We found out after the show that there is a Baptist Church in this town with about 15 members. One of the mothers who is a children’s worker in the church greeted us with joy and gave us some of the background of the church she attends. 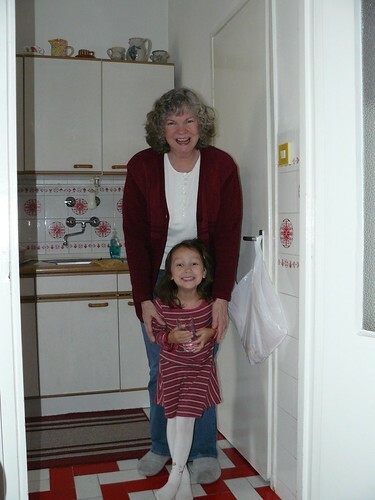 One of the Preschool teachers was very kind and spoke at length with Hugi and exchanged numbers with her. 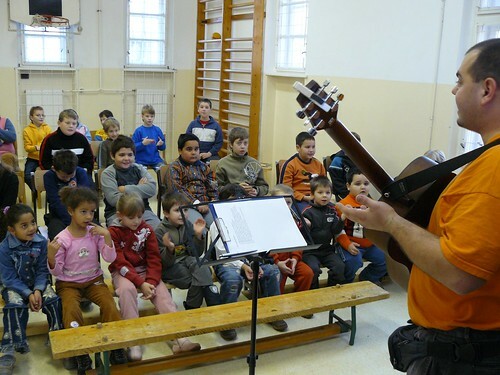 Praise God for His continued work in Hungary through others that we are not even aware of! Above: Just as we finished the show in Bér, the rain was turning into sleet as the temperatures continue to drop. We are so thankful that God protected us this entire week from weather that would restrict us from traveling. Above: It truly has been a privilege and a joy to serve with our team this year. They are true servants, humble in spirit and gave their all to take the truth of Christmas to over 900 kids in the various public schools we visited. Thank all of you that have been praying for us through this intense time of ministry. We are thankful to God who has heard your prayers and been a constant blessing to us throughout the week. May the Lord Jesus Christ be praised. Tomorrow we will be holding a Christmas rummage sale in the local community center. We expect many from the community to drop by throughout the day and will be offering them hot tea, conversation and Gospel tracts. 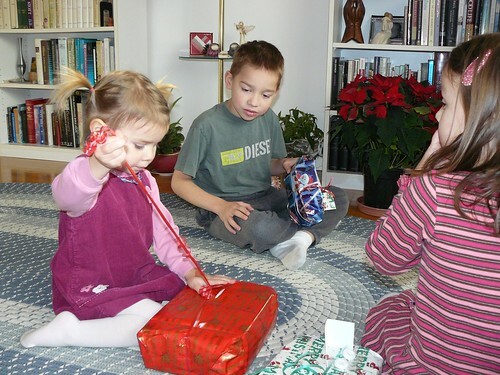 This is a poor community and we hope that many families will find inexpensive but special gifts for their children. Miki, Sharon and Brenda have been practicing through the week as they will be singing Christmas songs in the background. 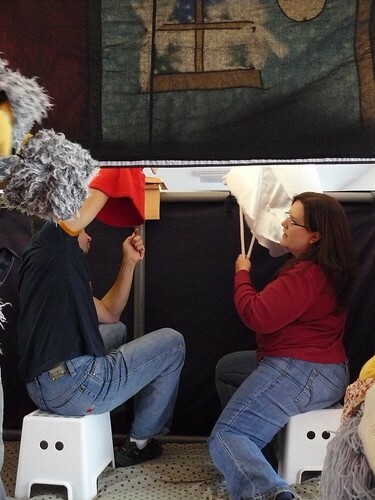 We will also present our puppet and shadow puppet show for the community tomorrow for those who missed it. 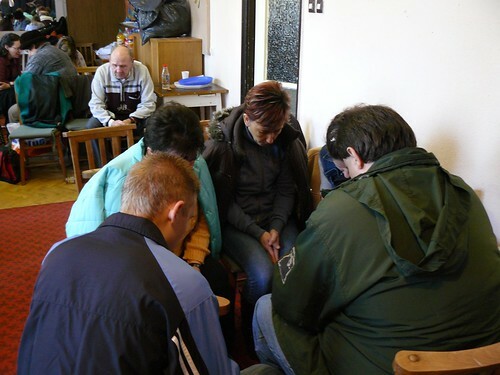 Please pray for God to open up new opportunities to share the Gospel with others. Pray also for us as we have been going full speed all week and need a good night’s rest and strength for tomorrow. Above: It has been raining here for the past few days. Since we travel a lot during puppet ministry, we are thankful that God has kept the temperatures higher and the roads clear of hazardous snow. 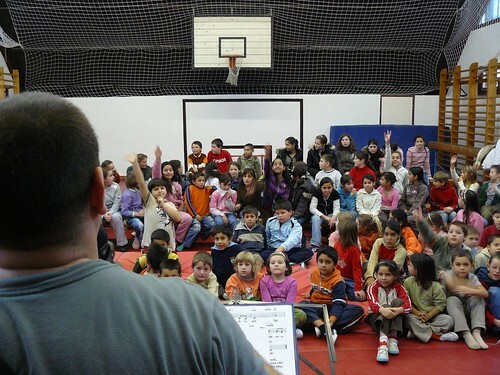 Above: Classic fun of tossing a ball into a basket keeps the kids engaged as we wait for the rest of the classes to arrive today in PetÅ‘fibánya (our hometown preschool). Above: Miki gets the kids’ imaginations warmed up as we pretend to fill the room with snow and go for a exciting sleigh ride. Above: Our daughters Elianna and Kira were able to see the show today. Elianna has been attending this preschool for a few years and our oldest Ben recently finished here and moved on to first grade in a neighboring town. Above: Kira finding a unique place to sit to watch the show. 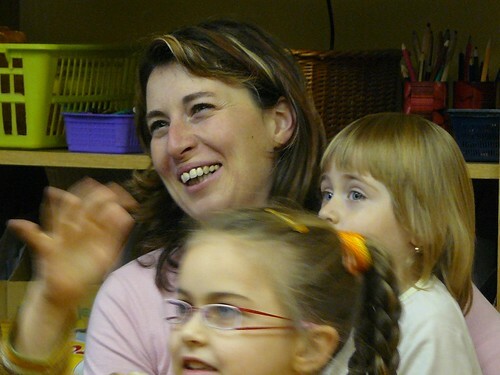 Over the years we have had good interaction with many of the teachers from preschool. 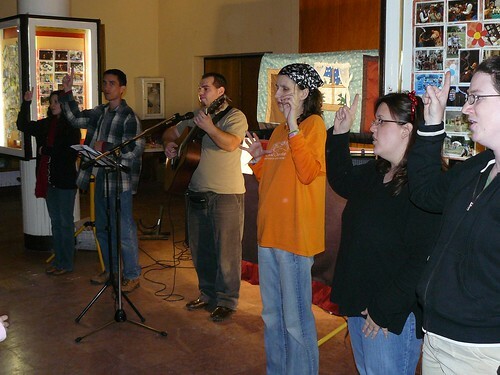 Some of them have attended our English Program, and some have visited various Bible studies. 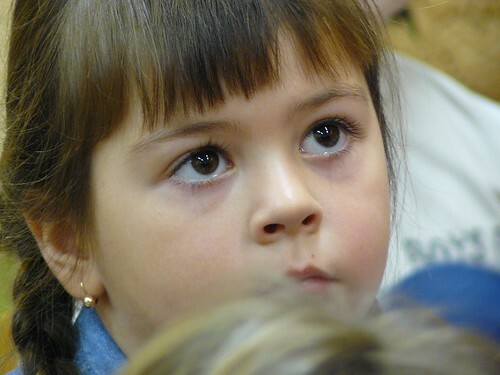 One preschool helper, Andi became a believer a few years ago and is now a member of our church. We are thankful for the open door into this school and the relationships God has allowed us to build over the years as our kids have attended here. 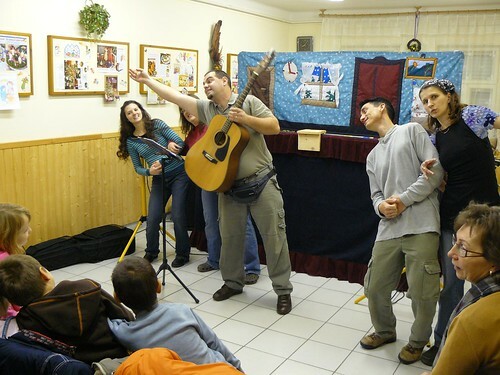 Above: Kids joining in as Miki leads us in singing about the compassionate heart of Jesus. Above: Before saying goodbye, we reveal the CD and magazine gift that God provided for all of the kids. As you can see, some literally jumped out of their seats with excitement. 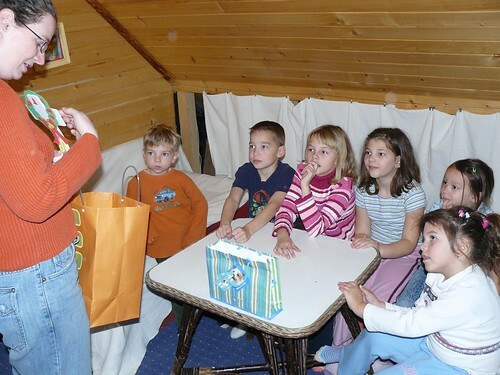 Above: A few kids, now teens, reconnecting with Heidi who last saw them a few years ago. Above: After the show, a young boy that accompanied this teen above asked me something that completely took me off guard. He said, “Are you saved?” I asked him three or four times, “What?” The words, although very familiar to me didn’t register at the moment. 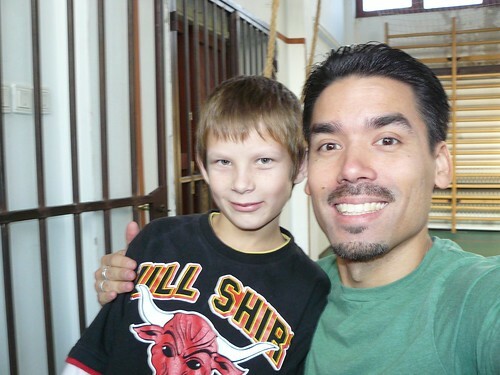 The teen above said to me afterwards, “He was asking you if you are saved.” I joyfully responded, “Yes, Yes, I believe in Jesus, that’s why I’m here!” Apparently the boys father is a local pastor of a small congregation in Jobbágyi. 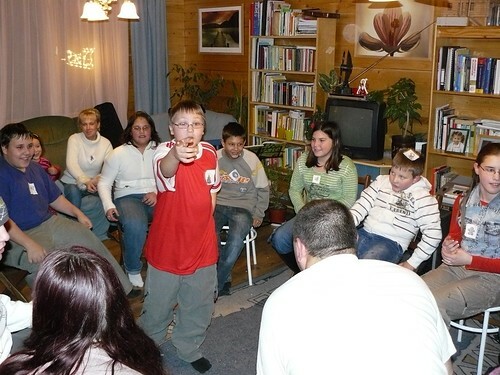 The teen above is a worship leader in the congregation. Jozsi (above) hopes to come out and visit us in PetÅ‘fibánya someday. It was encouraging to hear about how God is at work in these hidden places! Above: Although we have one more day to go, we planned a team meeting today for our tradition of sharing encouragement with each other personally. This is often tough for Hungarians to take as they have had limited to no encouragement all of their lives. It is easy to see how other people mess up, especially in this intense time of ministry together, but God calls us to build up and not tear down. It was refreshing to point out the various ways our teammates blessed us through the week and how they strengthened our ministry. We praise God for another successful day of ministry! Thank you for your faithful prayers for us that have blessed us through the week. Sharon’s trip into town to see the doctor went well. She is healthy. 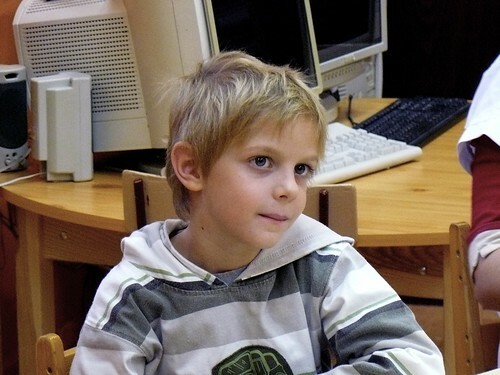 As far as Kira, the doctor still heard a slight murmur in her heart (problem since birth), but informed us that this condition poses no danger or restrictions to Kira living a normal active life. Praise God! • Our last day of ministry is a full day as we will have five performances. 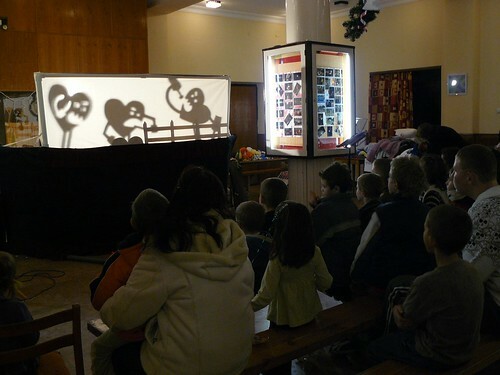 We will be performing under a tight schedule and showing our puppet/shadow show to the teens in two areas. This show is much more difficult to present than the puppet show. 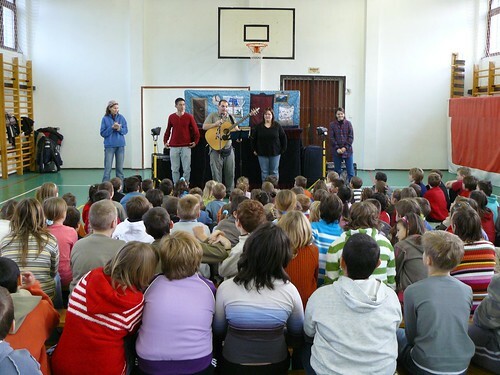 • This is the FIRST TIME that the neighboring village of Zagyvaszántó has allowed us to perform in their public school. As with the other neighboring towns in our area, some of the kids already know us from our VBS and other outreaches. 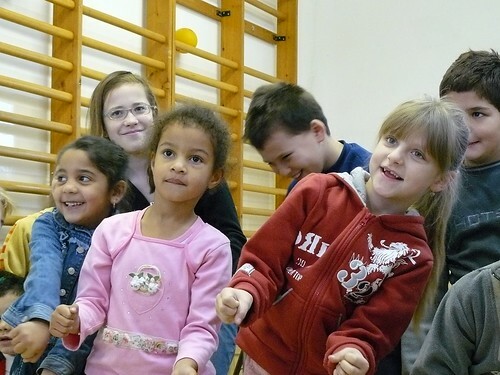 Please pray that God will give us favor with the teachers and leaders in the area so that we can continue to plant seeds in Zagyvaszántó through puppet ministry. • I still hear off and on coughing from teammates and ask that you would pray that our team be healed completely of sickness and have the strength we need for tomorrow for the five performances. 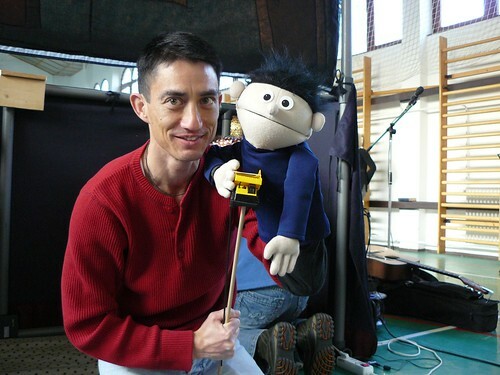 • Pray for me (Allen) as I will be sharing from the Word after the puppet/shadow show to the teens. 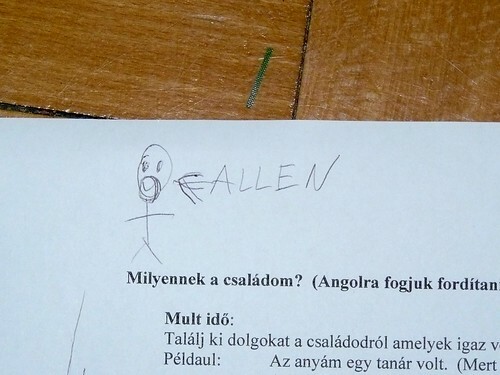 My Hungarian is far from refined, and sometimes this can be a distraction to the kids. Please pray that I will be able to communicate what God wants me to say. Above: We awoke to a mild misty winter day and after prayer (and coffee) we made our way to ErdÅ‘tarcsa (air - doo - tar - cha). We were greeted by the Mayor who opened the gate for the vehicles to pull in and unpack. Above: Taking the kids on an imaginary sled ride (or our morning aerobics). 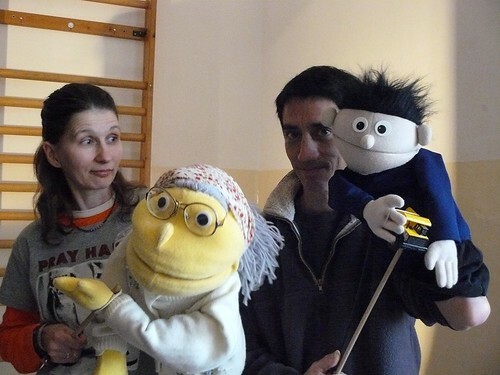 Above: We have visited ErdÅ‘tarcsa every year since we began this puppet ministry. We were even able to come out to do one day ministry events for follow up a few years ago. 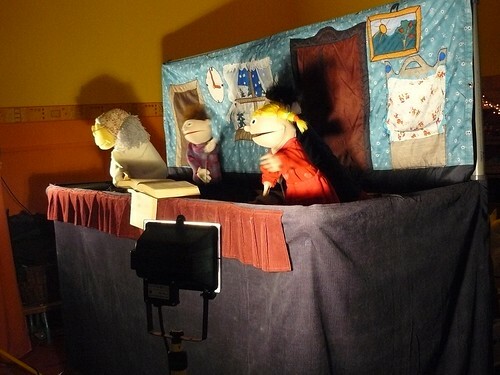 Because of our current responsibilities and limited time, we have not been able to return other than our puppet shows. It is our desire to reach out to more villages like this that are open to the gospel by inviting them to our VBS or expanding our VBS into other areas in the future. For now, seeds are being planted in these kid’s hearts and at least they are hearing the gospel twice a year in these programs. 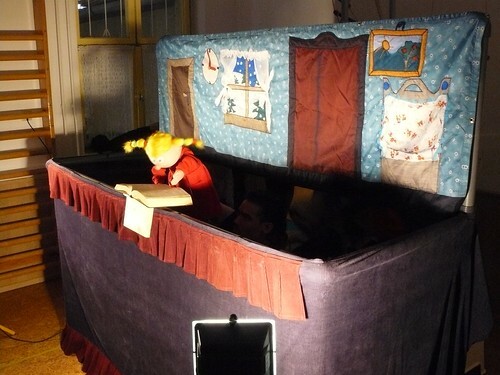 Above: Throughout the puppet show, Pani (above) is reading through various parts of the Christmas story from the Bible which a close friend gives to her. 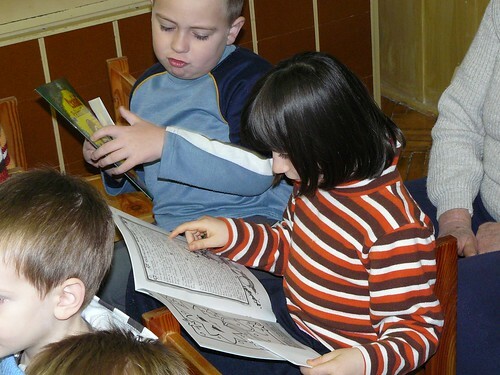 As she reads, various characters appear to teach her and to encourage her. Pani thinks about what she is reading and applies it to her current situation. 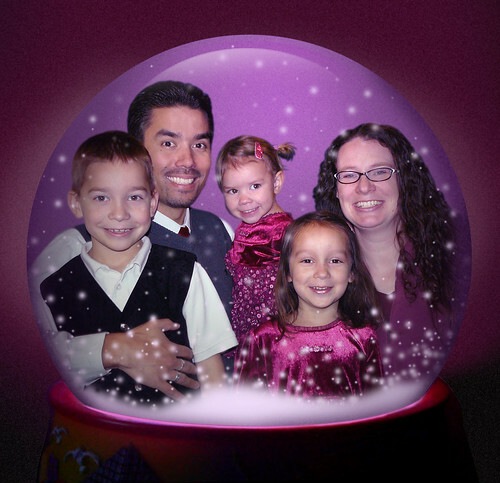 She ends up saying a prayer to put her trust in Jesus, “The greatest gift of Christmas”. 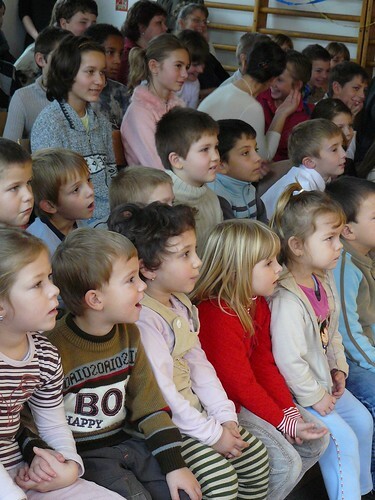 Above: Our second stop for the day was a small preschool in the town of Nagykökényes (Nauj-ku-kane-yesh). Above: Most of the kids were very young and sometimes in these situations a few are initially frightened as we march in with large boxes, suitcases and begin setting up. 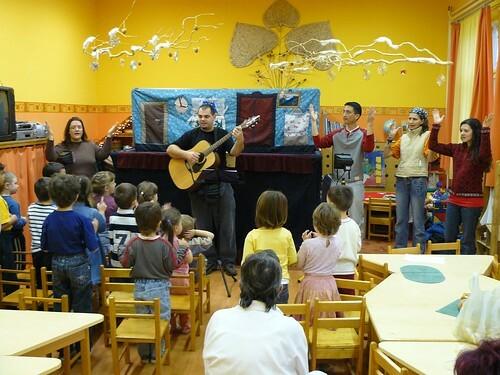 One girl (above right with teacher) began crying but soon after singing, she began to enjoy the show. 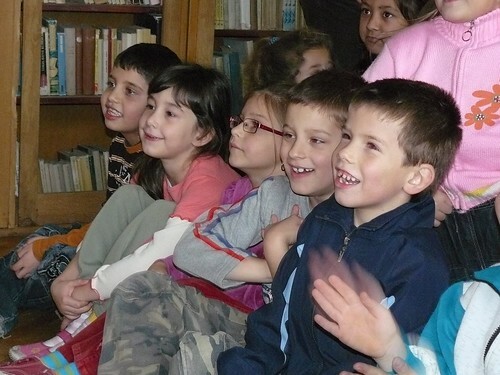 Above: The kids are always excited to receive the gift of a CD and magazine after the show. These materials are a great way to allow the ‘show’ to go on in their homes as they listen to Christian songs and read this Evangelistic Children’s magazine with their parents. We have purchased 1,300 of these to distribute and they are a bit over 50 cents a package. If you would like donate financially to cover our remaining cost for these materials, we would be blessed with $390 of financial donations. You can contact us for giving information. 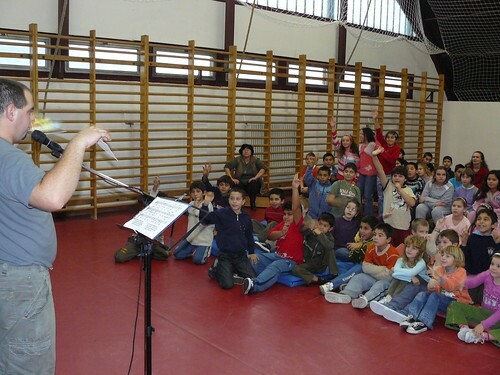 Above: There were over 160 kids in this audience and I wondered if there would be the problem with chatter in the show which distracts others. 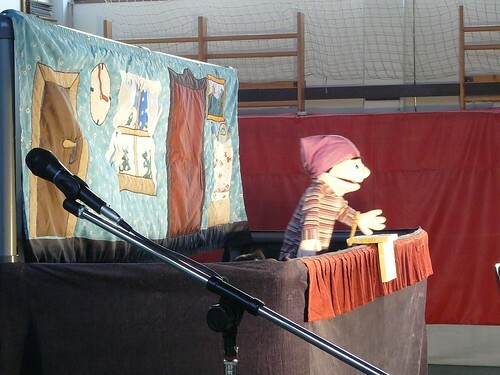 We praise God that the entire audience was attentive and God kept the room free of distraction when the puppets were explaining parts of the Gospel or praying for one another. Above: We believe this show not only impacts kids, but also teachers. 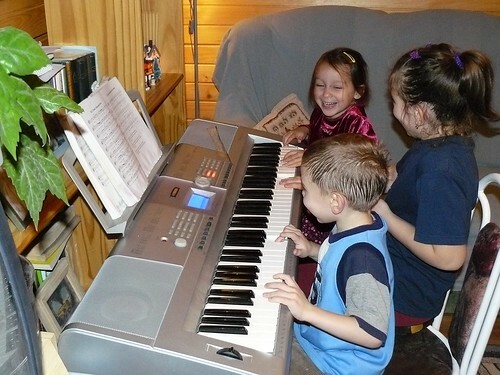 It seems as if over the years we have gained their trust and they are even more open to singing along with us. I sense that our spirits on the team were refreshed today as we have struggled with personal trials through the week. I told Miki today how thankful I was for our team that has proven to stick together under great stress and fatigue. These are marks of maturity in them and blessings from God as He leads us by His Holy Spirit. Miki’s son Bence is on antibiotic and is feeling better. Miki is still sick but feeling better. Brenda seems to be doing better as well. Although we had a tight schedule and three schools to visit, God gave us success in quickly packing and unpacking and gave us safety in travel. Praise God. • Tonight we will have our discipleship Bible study for Church members. Please pray for Miki as he leads the study on practical evangelism and pray for the members who will have opportunity this Saturday in a community Christmas event we are organizing at the local community center. • Sharon will be going into Budapest tomorrow for a follow up exam required weeks after a miscarriage. Kira will also have an appointment to have the small hole in her heart examined (it may have closed up by now). Please pray for protection, peace and healing both physically and spiritually. • Please pray for another good night of rest and refreshed spirits for tomorrow’s two shows. 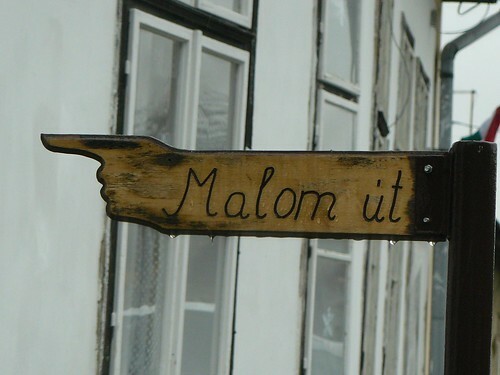 Above: Our destination today was the town of LÅ‘rinci, which is just a two minute drive from PetÅ‘fibánya. 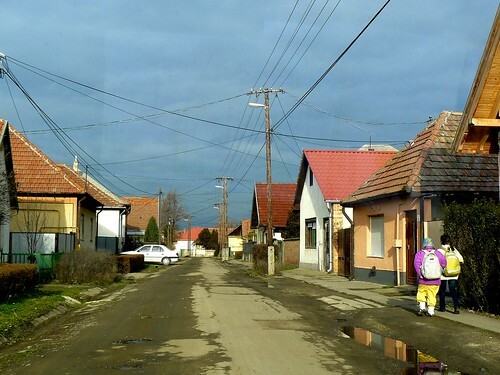 The above photo shows the typical look of most towns we visit. 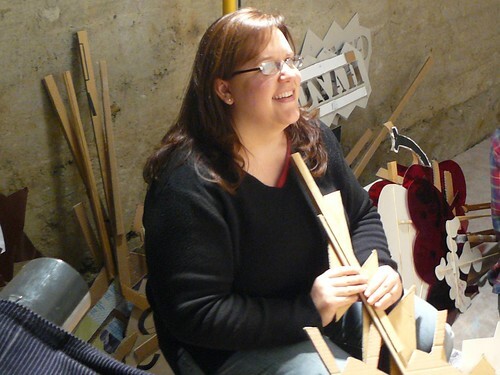 Above: Before the show, Brenda is usually busy spiking up puppet hair, checking props and putting all the puppets in the order they appear. Above: This is one of the largest schools we perform in. 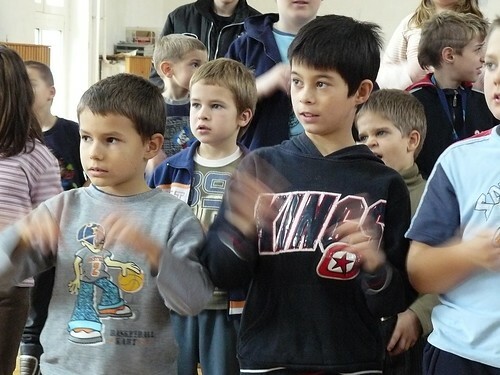 The teachers asked just before the show whether they could allow older students to attend as well. 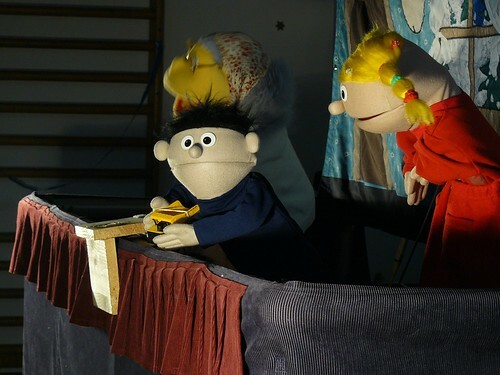 Even though this is a puppet show, it held their attention and hopefully clearly communicated the true meaning of Christmas. 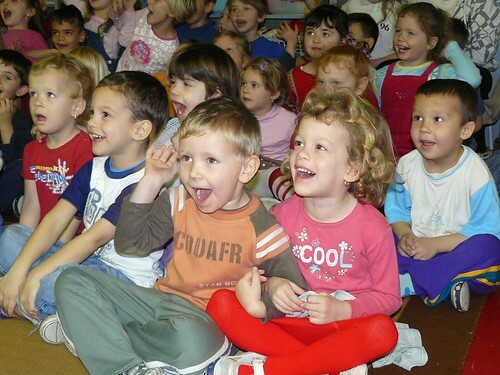 Above: The “Heart” song that we sing has a calming effect on the kids. 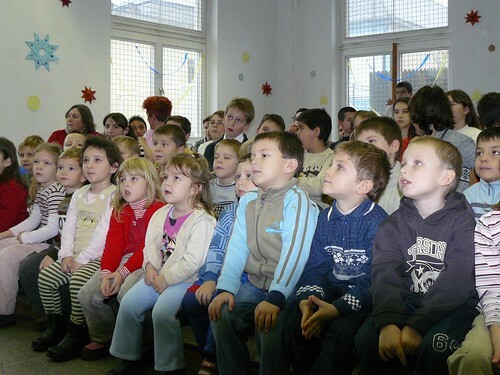 The room that was bustling with chatter with our ice breaker quickly became quiet as we began singing and encouraging the kids to join in with us. Above: High fives to the kids as they leave. We praise God for a successful presentation today. Tomorrow our schedule picks up as we have three shows back to back. Please continue to pray for us! When we met this morning, many of our spirits were down. Hugi was in tears because of a misunderstanding with a neighbor and Miki is sitll suffering from being sick. I believe we are feeling the physical burn that translates into feeling spiritually drained. December is always a tough month for us because it is a month full of opportunity because of Christmas. After taking it to God in prayer, I saw God offering comfort, strength and help throughout the day. Praise Him! 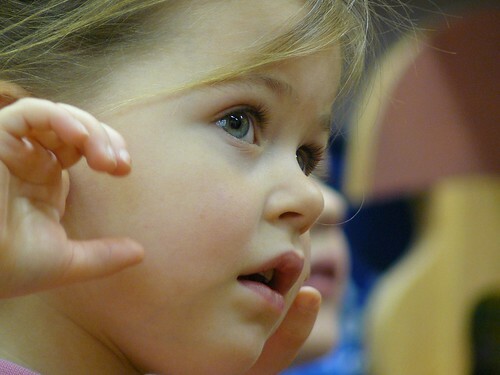 Above: One of the cute preschool kids from Szarvasgede paying close attention to the show. 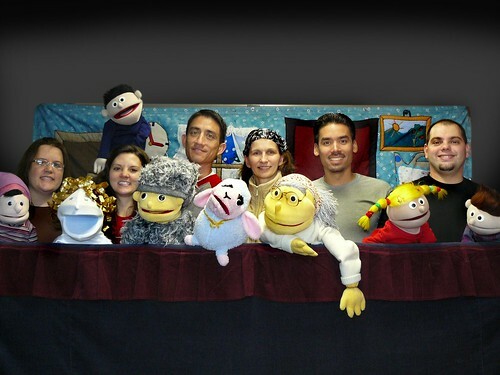 Above: This year’s Puppet Team L to R: Brenda, Miki, Roger, Hugi and Heidi. I was struck by the thought that each of us in our childhood came to have certain shows (mostly on TV) that we looked forward to seeing that were only presented at certain holidays. 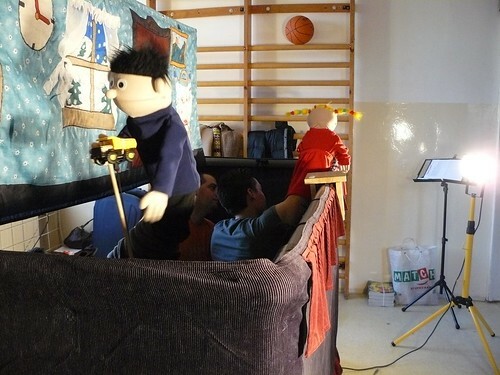 It is encouraging that many of these kids that we have seen every Easter and Christmas over the past five years may be developing the same type of longing to see the Puppet show at Easter and Christmas that creatively tells the true meaning of why we celebrate. 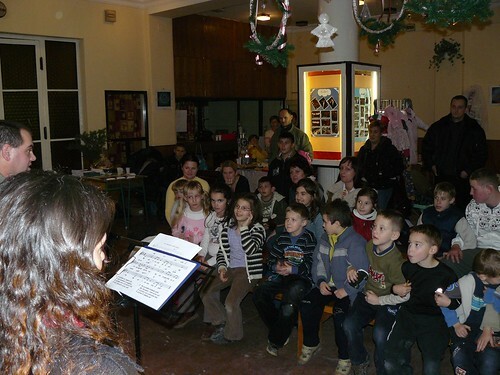 Above: After the show, the kids couldn’t wait to open the Christian children’s magazine we distribute as a gift along with a CD with the music and the puppet show. Above: Our second destination was the neighboring town of Selyp where we have done various outreaches and Bible studies in the past. This is one of the target towns that we hope to move on to in church planting after the church in PetÅ‘fibánya has the maturity to grow without us. Overall, this was a great day. I am thankful that all the equipment continues to work well, kids are paying attention and the Gospel through song, the puppet show and MIki’s message afterward is getting out. It helped to have the weekend to rest, and God continues to provide all that we need to press on. • Continue to pray for rest that refreshes us for new challenges for tomorrow. 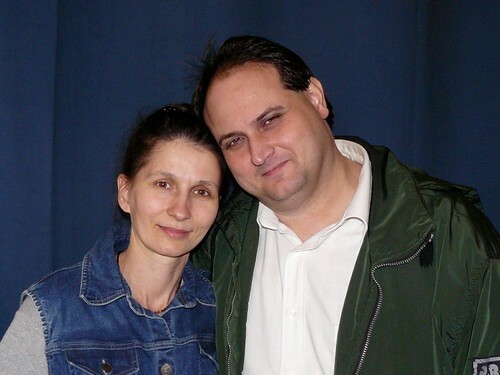 • Pray for Miki, his son Bence, and Brenda to be healed of their sicknesses. Pray also for protection from sickness. 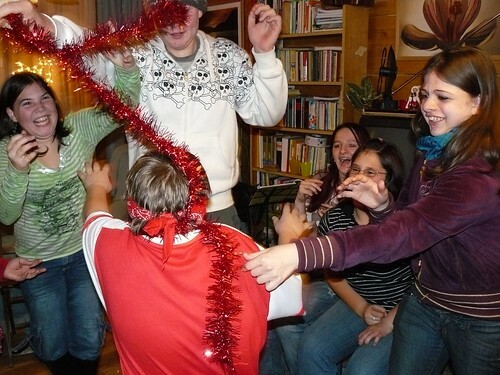 Above: Lots of teens came over to Miki’s house for our Saturday night Teen Christmas Party. Above: Sharon and Erika hiding out in the kitchen when things got out of hand. Above: We had plenty of fun playing group games, eating pizza together and just spending time together. 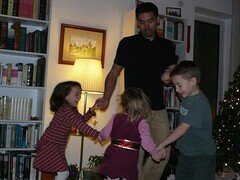 Above: Elianna having some fun with Miki and Erika’s kids, Bence and Anna. 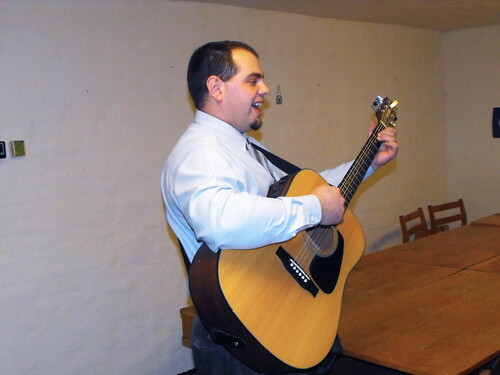 Miki and DezsÅ‘ spent most of the night playing Christmas songs in the background. We are thankful that these teens count us as friends and find these type of get togethers as safe and fun places to spend time. 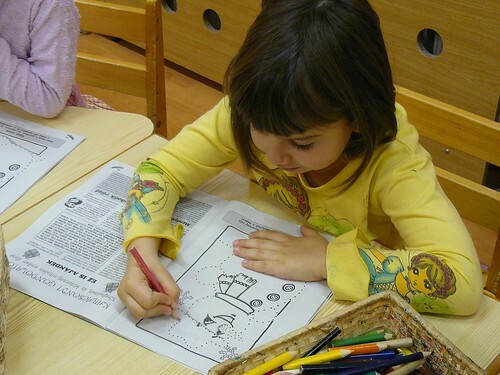 Above: Betti and Adrienn making paper crafts in Sunday School. 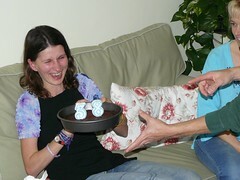 Above: Heidi blessing others in the body with thoughtful gifts. Above: Gábór (the husband of Hugi who is serving with us on our puppet team) sharing in our time for faith stories on Sunday night. Recently at his work place a request was made for many employees to stay to pack gift bags. The employees began complaining about how ugly the bags are and how they didn’t want to do the work. 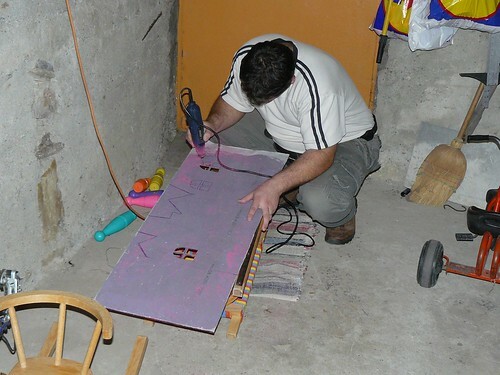 Gábór on the other hand remained positive and offered his help. His boss later inquired why he had such a contrasting attitude than the rest. Gábór was able to give credit to God who changed his life. The boss, although not a Christian was so thankful to have someone with ‘faith’ working for him in a work environment full of hopelessness. 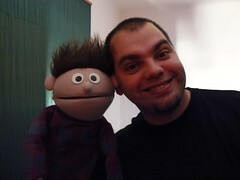 Tomorrow we begin our second week of Puppet and Drama Ministry. We value your prayers! • Healing for Brenda who came down with a cold this weekend. • Refreshing rest tonight as we need strength and stamina for tomorrow’s shows. • Miki’s son Bence had a high fever and is sick. Please pray for healing. 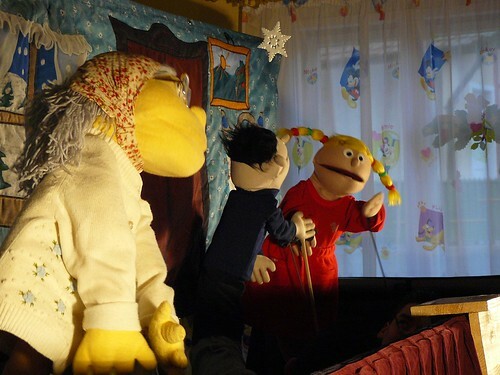 Above: A few hours after finishing Puppets yesterday morning, Heidi, Sharon and Brenda were busy preparing for last night’s English Club Christmas Party. Above: We had a great turn out and a great time together. 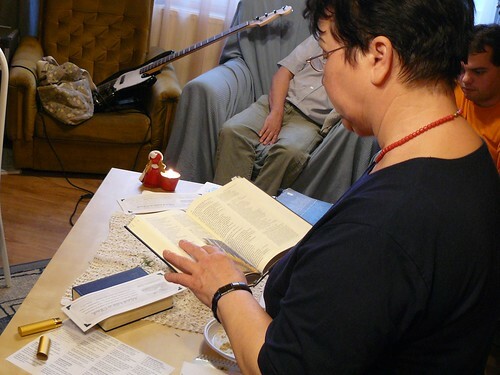 After having some conversation over home made chili and playing party games, Allen shared the importance of Christmas and read the Christmas story from the Bible in Hungarian. Above: After the party, Joe hung around chatting with Miki and shared some songs on the guitar. Joe shared with me that school is tough for him because he really doesn’t connect with any of the students in his class. I sense that he is feeling more comfortable with us and finds joy in spending time with us. We praise God for the relationships He is sustaining through the English Club and the open doors He provides to share His truth with them. 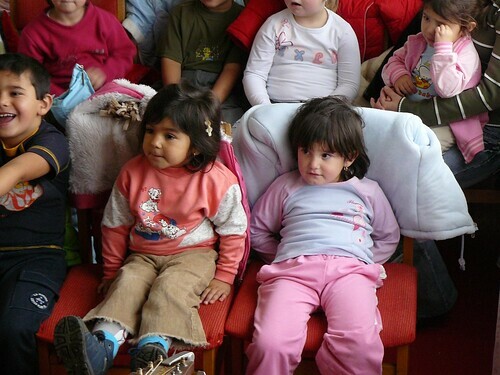 Above: Erika and Heidi getting eye to eye with the cute kids from our first destination in Hatvan’s Preschool today. 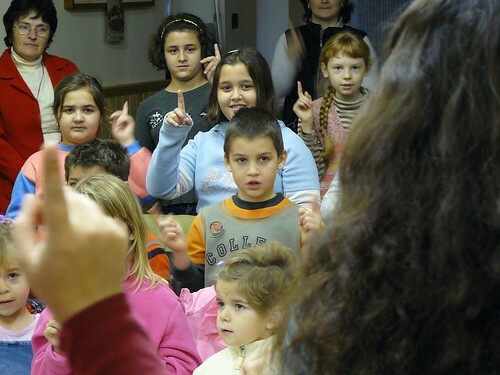 Above: Helping the children learn the words to our song about the loving and merciful heart of Jesus with hand motions. 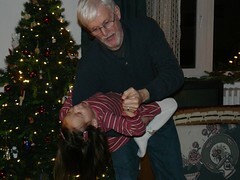 Above: Opening up with some fun pretending to sled together by locking arms and swaying left and right at Miki’s cue. 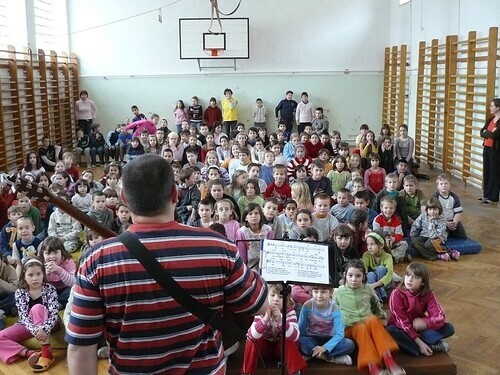 After our show in Hatvan, we headed back to PetÅ‘fibánya, historically one of the toughest schools to perform in. Out of the 18 schools that we are visiting this year, our hometown of PetÅ‘fibánya is the only school that required signatures from parents in order for the kids to be allowed to attend. They also scheduled the show after school hours unlike the other schools in our region. Above: Even with all the red tape mentioned above, we were thankful for a audience full of familiar faces from our hometown. Many of them have attended our VBS in the past years. Above: This year’s song captured their attention and even the boys that are usually busy distracting others joined in on singing! 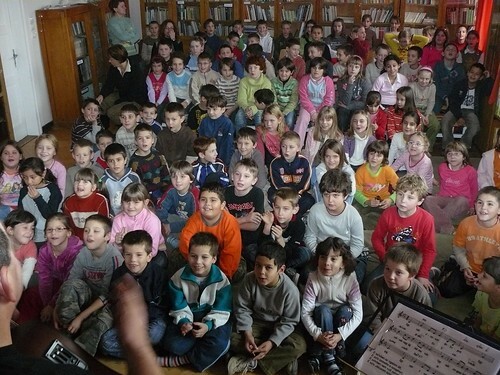 Above: Unfortunately, the school in PetÅ‘fibánya proved again to be the toughest. 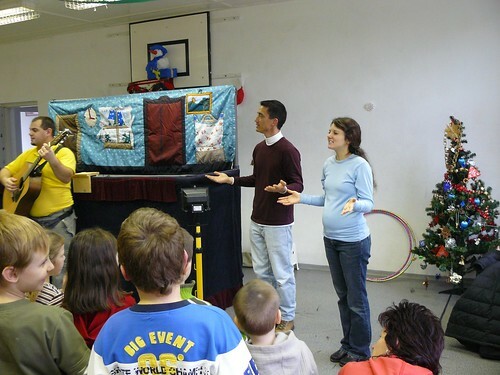 In the midst of the puppet show, there was off and on chatter of kids not paying attention at all. When Erika stood to speak, all at once everyone’s attention went elsewhere. The teachers stood idle toward the back paying no attention to the disrespectful behavior of the kids. They spoke through most of the show as well. I report this not as a complaint, but to highlight the contrast that we experience here as compared to the other schools. This town really needs Christ and we are thankful that God has put us first here to minister. 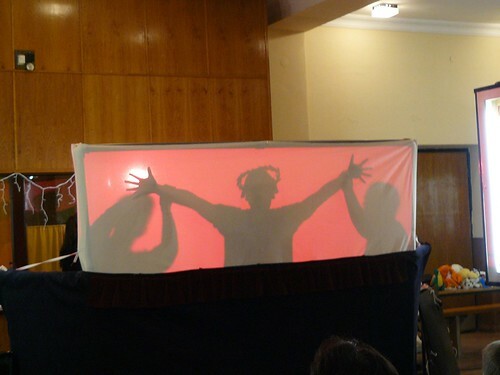 Above: After the smaller kids left the room, the teens attended our shadow puppet/drama presentation. This show held their attention and presented the gospel through the illustrative story of a dirty heart finding salvation through Jesus, the clean heart sent from God. In contrast the lack of ability of the younger kids to pay attention, the teens seem to be engaged as we talked about Jesus being the only way to escape sin, death and eternal separation from God. • God provided physical health and stamina for a tough schedule. • God provided unity, patience, good communication among members and abiding love. • God provided spiritual stamina. 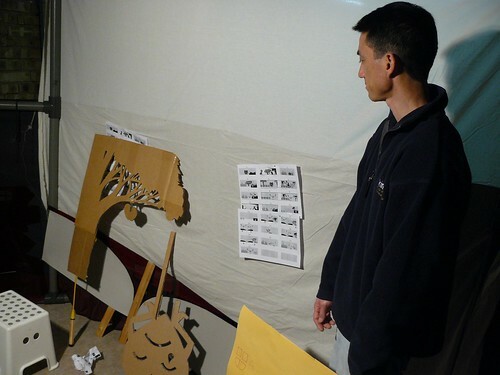 • God helped us complete the preparation for today’s shadow puppet and drama show for the teens. • God helped all the cars to WORK! • God helped His message of the Gospel to be delivered without distraction in most schools. Thank you for your continued prayer support! 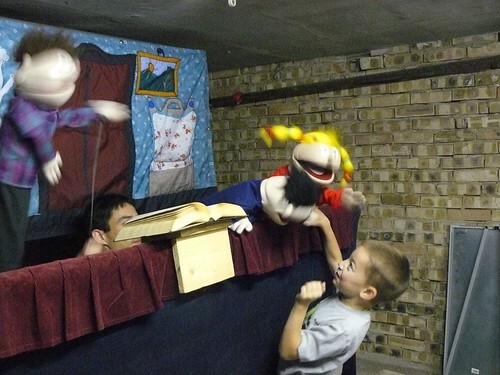 We will be off again on Monday to continue our Puppet Ministry through Friday. • Brenda is coming down with a cold. Please pray for healing. • Tomorrow night, we will be holding a Christmas party for the teens that attend our Friday night teen outreach. Please pray for God to open up doors to communicate His love and His truth to these teens. 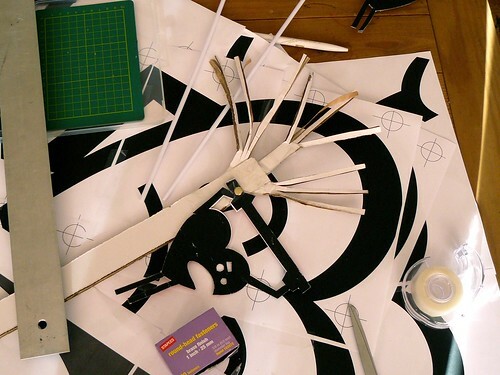 Above: Last night we put on the final touches to our shadow puppet/drama that we will present for the first time tomorrow. As you can see there are a number of intricate pieces that are brought in and out throughout the show. 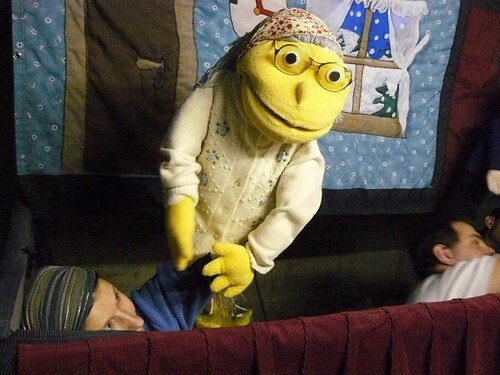 Above: Brenda’s main job is to avoid getting her eye poked out as we are constantly tossing shadow puppets back at her throughout the show for her to put back in order and hand back to us. It may be more entertaining to watch what goes on behind the scenes. Brenda celebrated her (clearing throat sound) birthday yesterday. 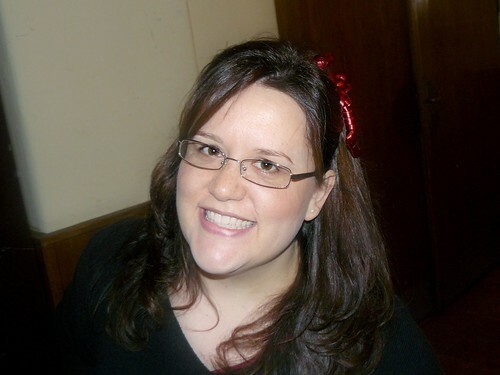 We are thankful for God creating her and especially thankful that He lead her to Hungary to serve with us! Above: Helpful Hugi. There is alot of team work involved in the putting up and tearing down of the set. The team has worked very well together under pressure and God has been gracious to continue to bless us with unity. 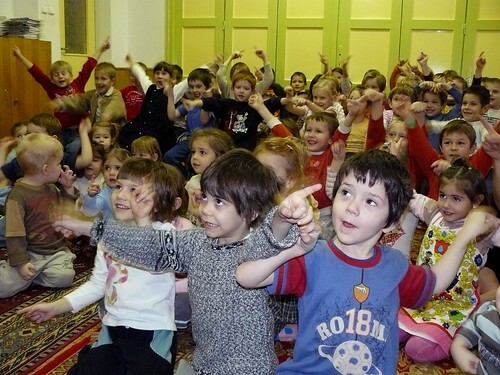 Above: The Rainbow Care Center in Hatvan that we went to today holds a special place in our hearts. 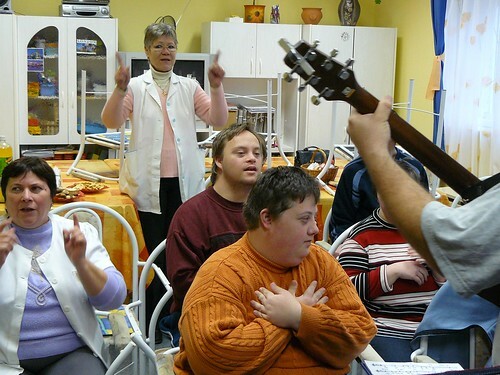 They always express the most joy and love to sing with us. Since this was our only show today, we had some time to stay and chat with the teachers. 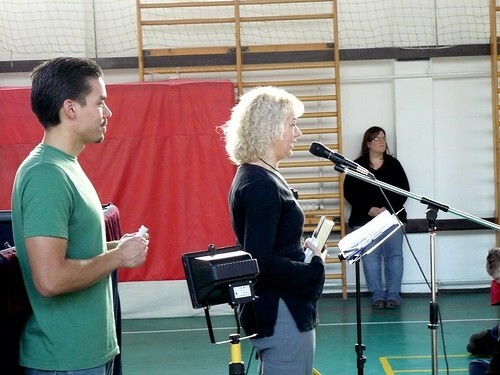 Hearing that four from our team were from the US, one teacher asked, “So how is it that you came to be in Hungary?” I was able to give testimony of my belief in Jesus Christ, and God’s directing me to Hungary in a season of prayer over eight years ago. 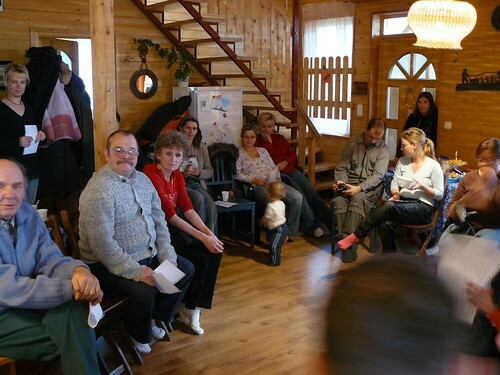 She was very thankful for our show and suggested that we contact another Care Center they are connected with in the town of Gyöngyös. 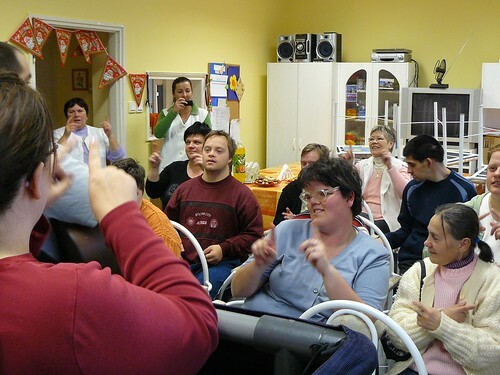 Hopefully we will be visiting this Care Center when we go out again in Easter. • Weather has not prohibited us from traveling to schools. 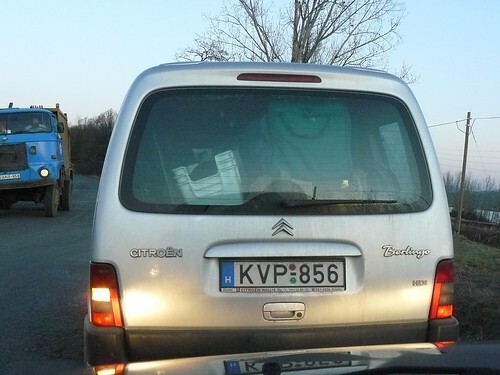 Safety traveling. • Unity on team and God has provided strength. • Kids are hearing the gospel and taking home CDs and magazines full of God’s truth. • Tonight we will be holding a Christmas Party for our English Club students. 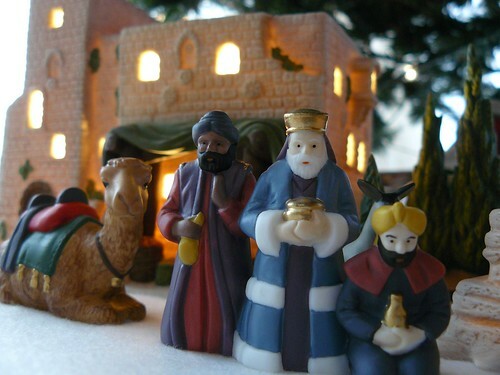 Please pray for us as we prepare and for the true story of Christmas to be made known. • We are nearing the mid marker and we are feeling the physical strain. Please pray for protection from sickness and for rejuvenating rest at night. • Tomorrow is a much fuller day than usual. 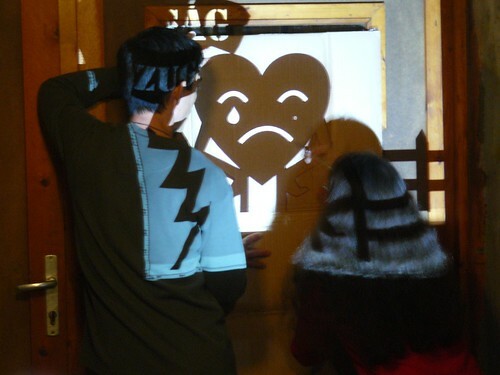 We will also be presenting our shadow puppet/drama to the teens for the first time. We need strength and wisdom as we present with these tools God has blessed us with. 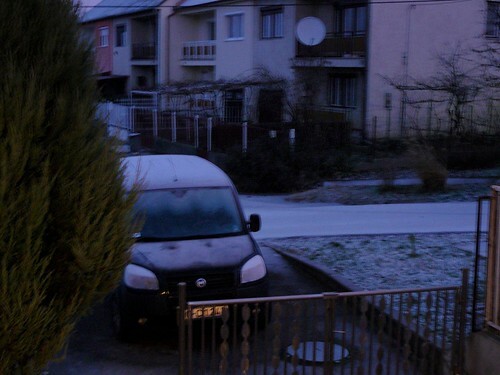 Above: We woke up to a cold frosty morning which coated the roads with ice. We praise God for protecting us as we traveled in two cars to the small town of Heréd. 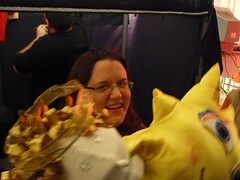 Above: We arrive with about thirty minutes to set up our stage and prepare the puppets. God has blessed us and allowed all the set materials to work without any problems. 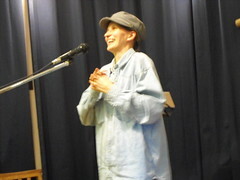 Above: After the show, Erika was able to share about the importance of Jesus Christ coming into the world as our Savior. It is amazing that God has kept these doors open in the public schools over the past four years where we are freely able to read from the Bible and deliver the Gospel every Easter and Christmas. 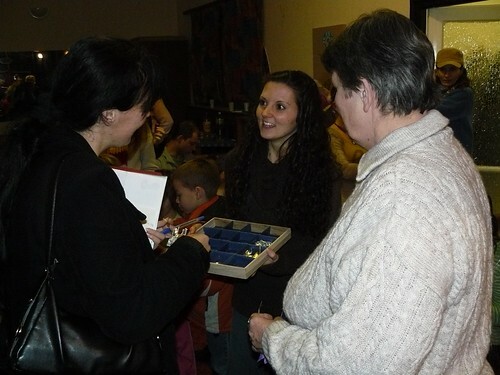 Above: distributing the evangelistic CD’s and magazines for teachers and children after the show. • Miki and Roger’s health are improving. Overall health of the team is great. 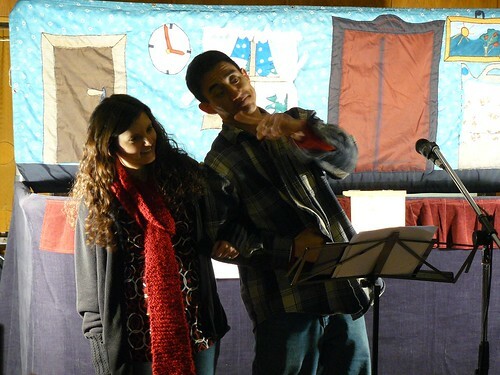 • Last night we were able to complete preparations for our drama for the teens which will be presented on Friday. • Although the roads were hazardous, God gave us safety in traveling. • Kids are paying attention and all set materials are working well. Tomorrow after puppets, our team will be prepping for an English Club Party at our house. Please pray that the students not only to have a good time, but that God would open more opportunities for us to share our faith through this time. Pray also for our team to have the strength for preparations for the party. 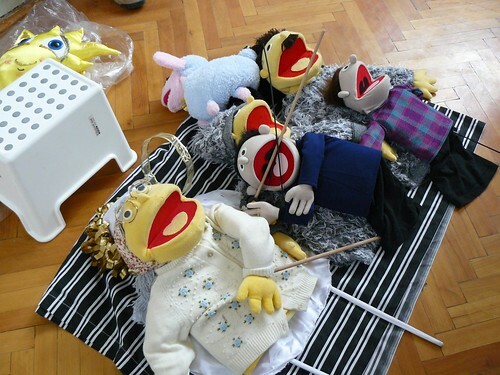 Above: After puppets yesterday, we went back to work preparing for our drama presentation for the teens. Miki did the tough part of skillfully grinding and cutting red plexiglass for some of the background images in our shadow show. 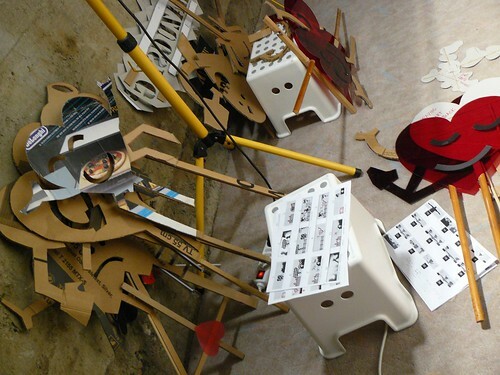 Above: The majority of our set pieces are cut from thick cardboard and reinforced with whatever I could find in the garage. A lot of the cutting was tedious, but the majority is now done. Above: The final effect is quite interesting and should hold the teens attention as we tell the story of the Gospel. These shots were taken last night as we began to put into action what we had envisioned over the past few weeks. 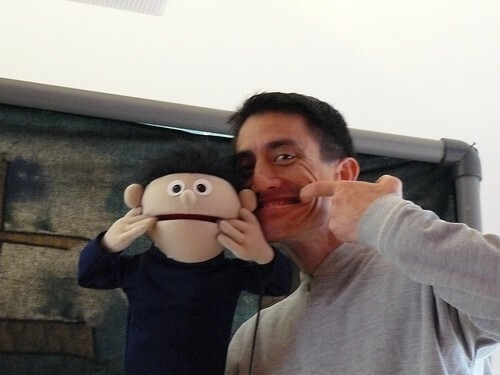 Today we have off and we will leave tomorrow morning for a new day of puppet ministry. • The temperatures have significantly dropped today and there is always the threat of snow this week. Please pray that the weather conditions would not prohibit our traveling plans. • Miki and Roger are still recovering from head colds. Please pray for complete healing. • We will be holding our final practice for our shadow show for the teens Wednesday afternoon. Please pray for wisdom and success in putting it together. Above: We met early in the morning for a brief time of prayer and packing up the cars for our Puppet show in Egyházasdengeleg (edge - ha - zos - den - ge - leg). We praise God for good weather for travel (no snow), and for success in reaching our destination today (the winding back roads can be confusing). 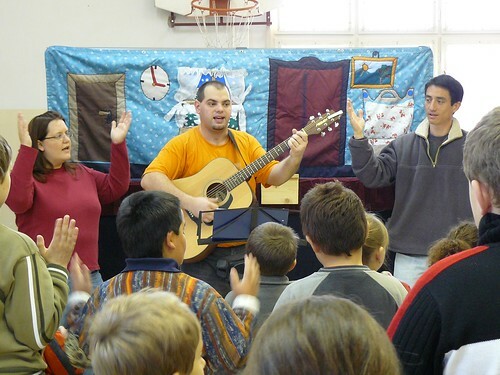 Above: Miki leading the kids in singing a song about the compassionate heart of Jesus Christ. Above: A little fun with the kids pretending to be on a sled together. We have visited this school over the past four years and have seen it go through major changes. Due to the lack of funding for schools and teachers, half of the students and teachers were sent elsewhere while the youngest stayed. It is always encouraging to see familiar faces at these shows and being able to hear from them, “I remember you.” The kids were very attentive and the teachers were gracious to us. 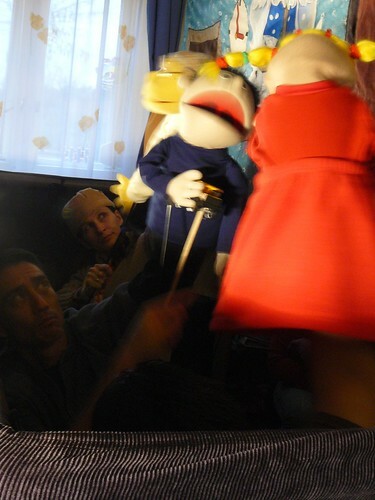 Above: Behind the curtain, Hugi and Roger prepare their puppets for action. 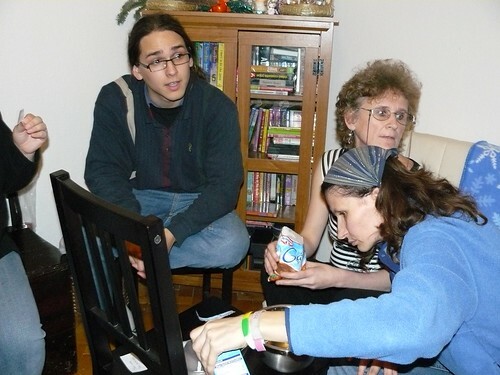 Above: After the show, two teachers invited to speak over coffee and snacks. 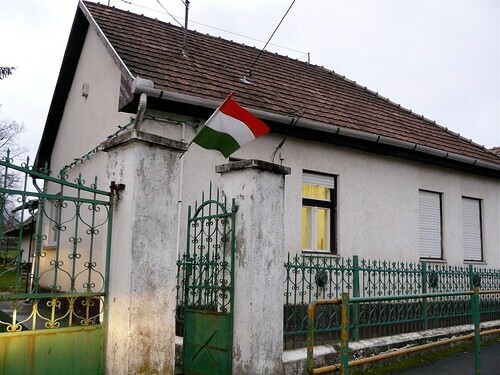 The conversation was full of pessimism and hopelessness as they spoke about the deteriorating state of Hungary. They spoke about the destruction of families, the influence of materialism, the lack of help from the government. They told a story about an acquaintance who died because they were sent away from the hospital to return one day later, but it was too late. The teacher also told us of her personal financial problems that related to government funding. Over the past four years, her salary has dropped 40% instead of being raised in increments. Unfortunately, there is nothing she can do to find more work. 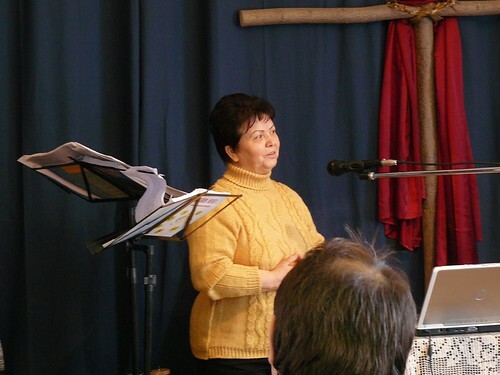 In the midst of the conversation Miki and I were able to highlight Hungary’s need for God. We shared that we are going after the root of the problem by helping people to turn to Jesus Christ. They were very open and honest in their conversation and we were thankful for the time to share with them our hope in God as our provider and source of peace in the midst of a very unstable world. This was a great first day of ministry...thank you Lord! • We are still preparing materials and need to practice our separate drama that will be given on Monday. Please pray for wisdom and success in putting it together. Thanks for your prayers! We are off tomorrow (Tuesday) and our next show will be Wednesday morning. 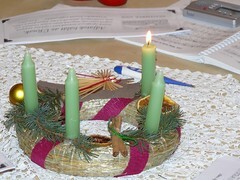 Above: Sharon helping the kids with a special Christmas craft in Sunday School. 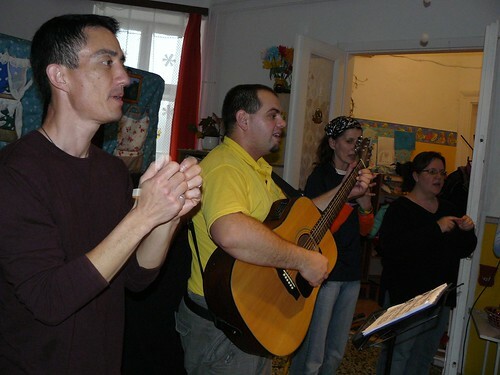 Last Sunday we gathered in Miki’s home to worship God with a focus on thanksgiving. A few weeks ago, teammate Brenda had church members write out specific praises to God as to why they were thankful this year. In Sunday’s service, after a potluck lunch we gathered in a large circle and took turns sharing thanks and praying for one another. 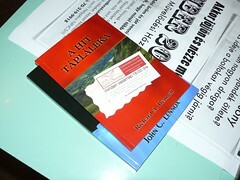 Afterwards, we gave them a book containing their handwritten thanks. 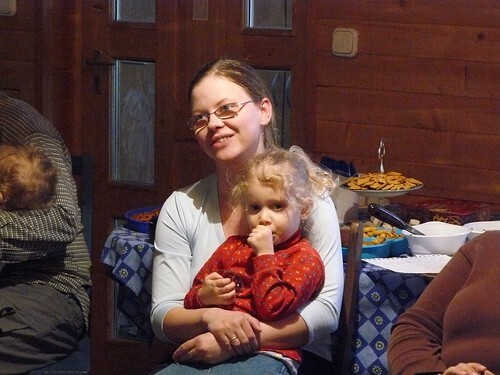 Above: Church member Lidia (Lid - ee- ah) holding her niece Alina (ah-lee-na) while sharing why she gives thanks to God. 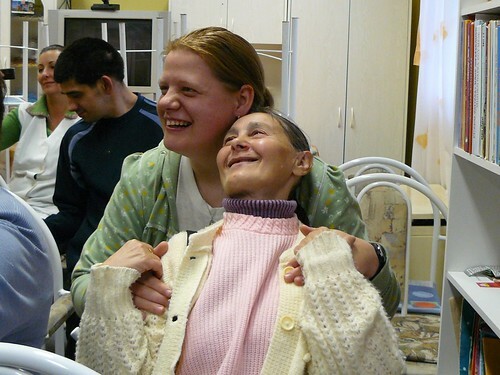 Hugi told us the next day that this service was one of the happiest days of her life. Above: Church member Marika (Mar-ee-kah) reading from Isaiah 53 as we remember the prophets who told of Jesus Christ’s coming lighting the first candle in the advent wreath. 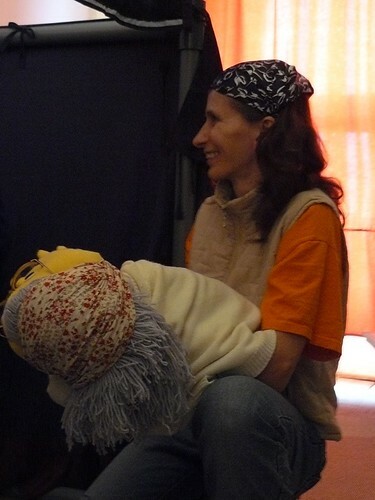 Above: Hugi taking the role of the grandmother in this year’s puppet show. Above: Having some fun with Ben in the midst of practice in our basement. This year’s show is about a girl who allows her little brother to wonder off alone while it was her responsibility to watch over him. 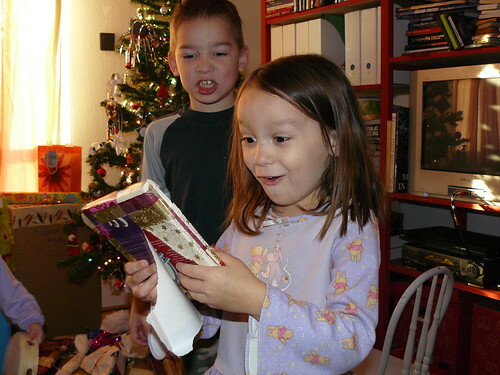 Instead of watching him, she was busy searching for Christmas presents hidden in her house. In the show she deals with guilt, conviction and thankfully has the help of a friend who tells her about the true reason to celebrate Christmas. Her friend shares the gospel with her and offers her a Bible to read while others in her family are searching for her lost younger brother. As she reads different portions of the Bible, the words come to life helping her to understand and helping her to receive forgiveness and trust in God. The show ends with her little brother being found. 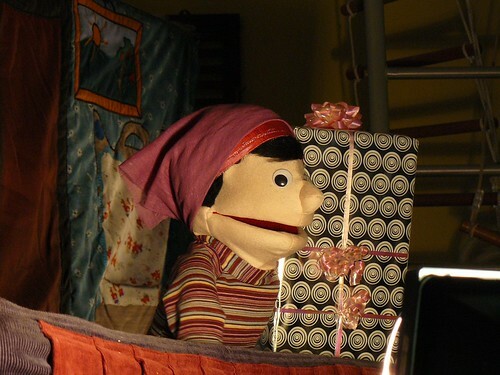 Please pray for us as we begin our first Christmas puppet show this Monday! 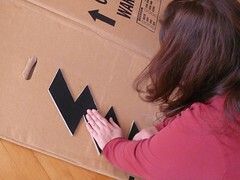 Above: Prepping materials for our show for the teenagers who will not see the puppet show. 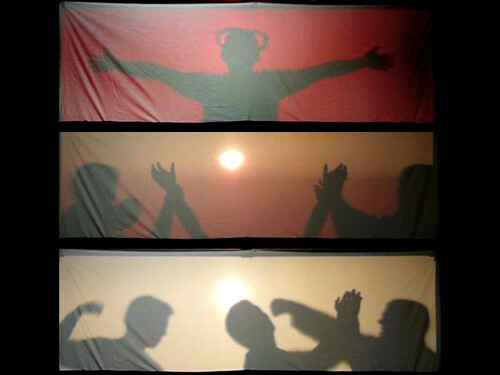 We will be performing with shadow puppets and shadow acting the story of creation, separation from God because of our sin, the coming of Jesus and the way of being restored through belief in Him. Please pray for us as we are still working out the final props and details of this show for the teens which will be performed this Friday. 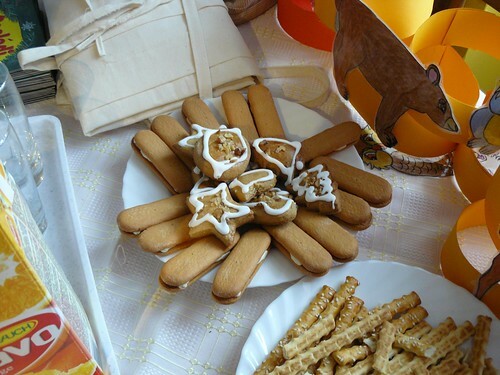 Above: We had a lot of fun at our English Club pretending to be animals and making pudding (every day stuff right?). 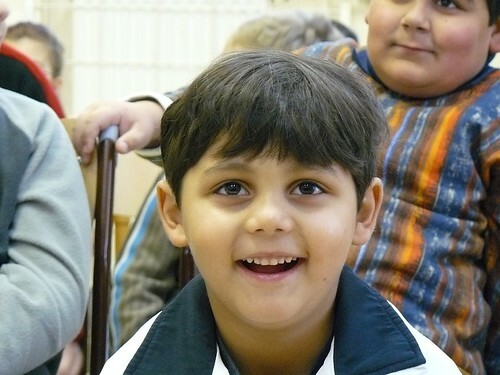 Pictured above left is a new student named Jozsi (Joe). 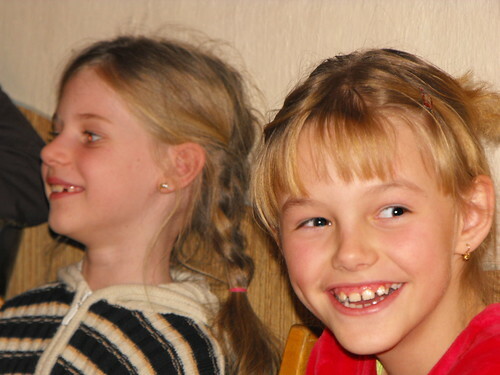 Jozsi’s little sister has attended our VBS the past few years, and his parents own the local flower shop in PetÅ‘fibánya. 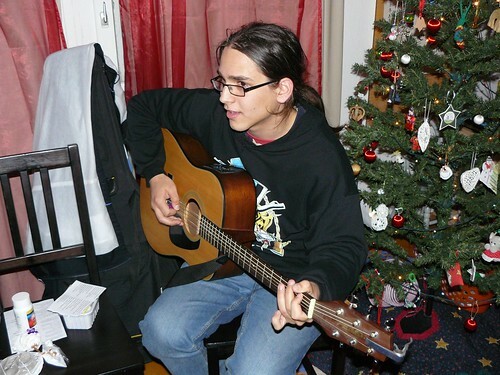 We found out recently that Jozsi is in music school and plays the guitar. He may even help us in next week’s English Club Christmas Party to play some songs. Initially, he was very hesitant coming and seems to be very careful and shy. I am thankful to see him opening up, and a desire to just hang around even after the English Club ended. Please pray that God would be gracious and personally reveal Himself to Jozsi and the other students in this special time when we celebrate the coming of Jesus Christ into the world. Above: One of the teenagers in class making good use of his time. 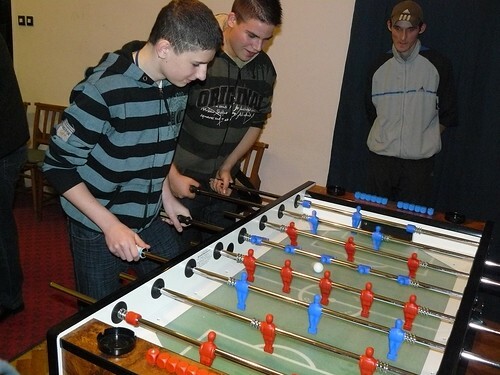 Above: Bondi (Bon-dee) pictured left playing with Bence (Ben-seh) is a teen that used to play soccer with us a few years ago and we lost touch. Tonight he came for the first time to our Friday game night. We are thankful for the few times that we get to see these teens and hope that God will do a mighty work in their hearts to draw them to Himself. 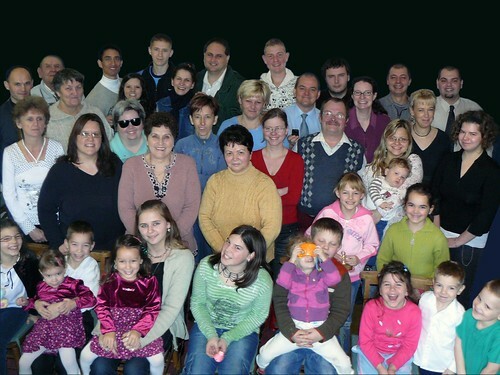 We praise God that 12 people have volunteered to pray for us daily as we begin our Puppet and Drama ministry on Monday. As you remember us would you also pray? I will attempt to post updates each day we go out with praises and prayer requests. Please bookmark this page, or subscribe to the RSS feed to see the latest updates this week! Thanks for your support.